Human disturbance can affect penguins and their behavior1. Penguins might simply ignore visitors and continue acting normally when humans approach but they can also react negatively by running away from our presence, staying away from their nests, or in rare cases they might react aggressively toward us or towards each other. Aggressive or stressed reactions are triggered by internal physiological mechanisms that are mediated by hormones. Stress responses, for example, are mostly mediated by corticosterone. 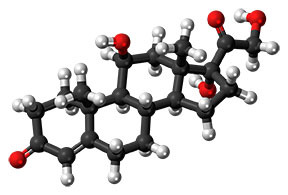 Corticosterone is a hormone involved in energy regulation, immune reactions and stress responses2. Corticosterone has been largely studied in birds and the literature is vast. Some examples show that birds with increased levels of corticosterone have slower feather growth2. Other studies show that levels of corticosterone are associated with certain personality types. Corticosterone can affect birds in their early lives as it is responsible for increased begging for food in chicks and for high levels of aggressiveness2. Ball-and-stick model of the cortisol molecule, a steroid hormone that controls the body’s response to stress. As said before, the production of corticosterone can affect plumage quality. This is important for species that produce ornamented plumages to attract mates. 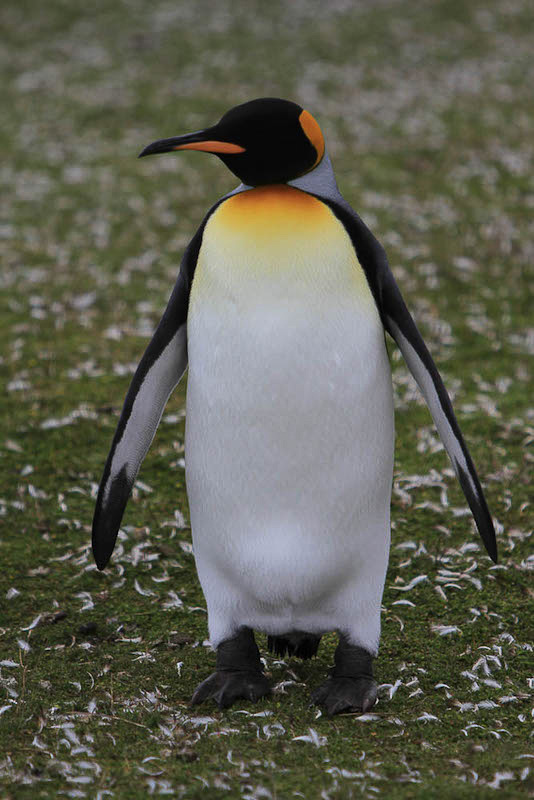 The King penguin for example produces ornamented colors when it’s time for breeding: the yellow‐orange and UV spots on its bill and yellow‐orange auricular feather patches3. Scientists found that physiological stress experiments during feather molt might affect the quality of color, in particular the production of yellow3, highlighting the possibility that ornamentation in birds is a costly physiological process. The most well-known stress response in penguins occurs when humans visit their colonies. In a colony of Magellanic penguins, scientists discovered that capturing penguins caused high levels of corticosterone4. However, penguins living in tourist-visited areas did not show such a strong response in comparison with penguins in isolated areas. 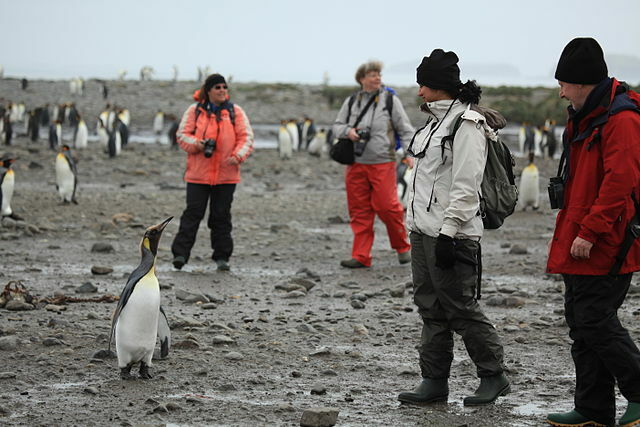 This shows that penguins in tourist-visited areas have probably habituated to the presence of humans4. However, caution is needed when interpreting these results, as the long-term consequences of this physiological habituation are still unknown. Corticosterone can also be involved in parental care, as it acts in combination with other hormones. In a study made in nesting Macaroni penguins, scientists found nesting females with high levels of corticosterone5. Interestingly, those females produced heavier chicks than females with low levels of corticosterone. Thus, the authors concluded that corticosterone in this species, more than other hormones, were key for parental care5. Something important to remember is that responses to stress are not necessarily stable throughout an individual’s life. A study in Adelie penguins showed that repeated handling did not affect corticosterone levels, although they found significant differences among individuals6. When the researchers extended the study for a longer period, they detected high increases in corticosterone levels, only when birds had fasted for over 50 days6. This finding highlights that stress responses are not equal at all times. Interestingly, corticosterone is also related to personalities. As in humans, birds can have distinctive repeatable personalities. Nesting Adelie penguins with low levels of corticosterone and with proactive personalities were more likely to be successful at times when environmental conditions were predictable. In contrast, when conditions became unpredictable, penguins showing high levels of corticosterone and reactive personalities were the more successful rearing chicks7. In summary, we have seen that the daily lives of penguins are governed and highly influenced by these invisible particles called hormones. One single hormone can affect the most important aspects of the life cycle of a penguin: it influences molt quality, successful reproduction, chick rearing and eventually survival. Although corticosterone triggers an important mechanism that is useful to confront life threatening situations, like escaping or responding to a predator when being attacked, it can also have negative consequences. Corticosterone might affect early life and long-term survival, if individuals are exposed for prolonged periods of time to high levels of corticosterone. Thus, this hormone can also impact individual’s health2. An important take home message for humans that have the opportunity to visit penguin colonies is to avoid stressing penguins by getting too close. Respect the recommended distances when visiting colonies of nesting penguins. We do not want to make penguins’ lives more stressful than normal. Did you know penguins got stressed? Pretty much like humans. Love hearing your thoughts. FRENCH, R. K., MULLER, C. G., CHILVERS, B. L., & BATTLEY, P. F. (2018). 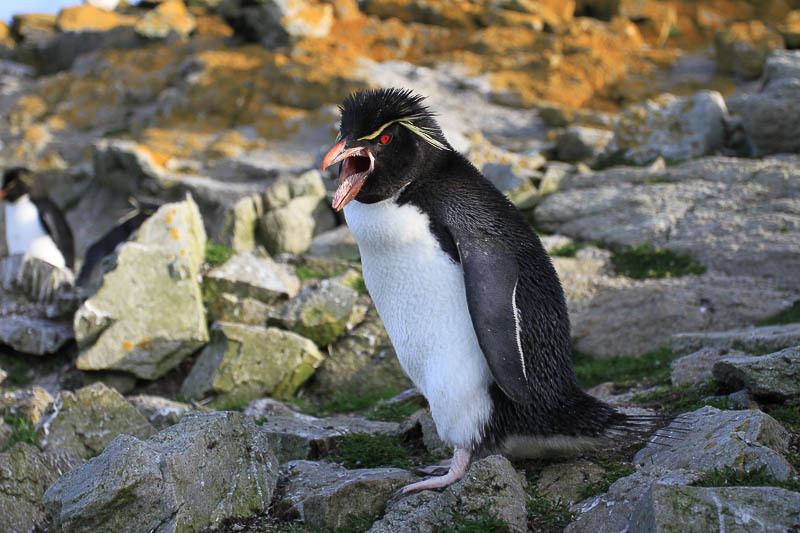 Behavioural consequences of human disturbance on subantarctic Yellow-eyed Penguins Megadyptes antipodes. Bird Conservation International, 1-14. Schull, Q., Robin, J. P., Dobson, F. S., Saadaoui, H., Viblanc, V. A., & Bize, P. (2018). Experimental stress during molt suggests the evolution of condition‐dependent and condition‐independent ornaments in the king penguin. Ecology and evolution, 8(2), 1084-1095. Walker, B. G., Dee Boersma, P., & Wingfield, J. C. (2006). Habituation of adult Magellanic penguins to human visitation as expressed through behavior and corticosterone secretion. Conservation Biology, 20(1), 146-154. Crossin, G. T., Trathan, P. N., Phillips, R. A., Gorman, K. B., Dawson, A., Sakamoto, K. Q., & Williams, T. D. (2012). Corticosterone predicts foraging behavior and parental care in macaroni penguins. The American Naturalist, 180(1), E31-E41. Vleck, C. M., Vertalino, N., Vleck, D., & Bucher, T. L. (2000). 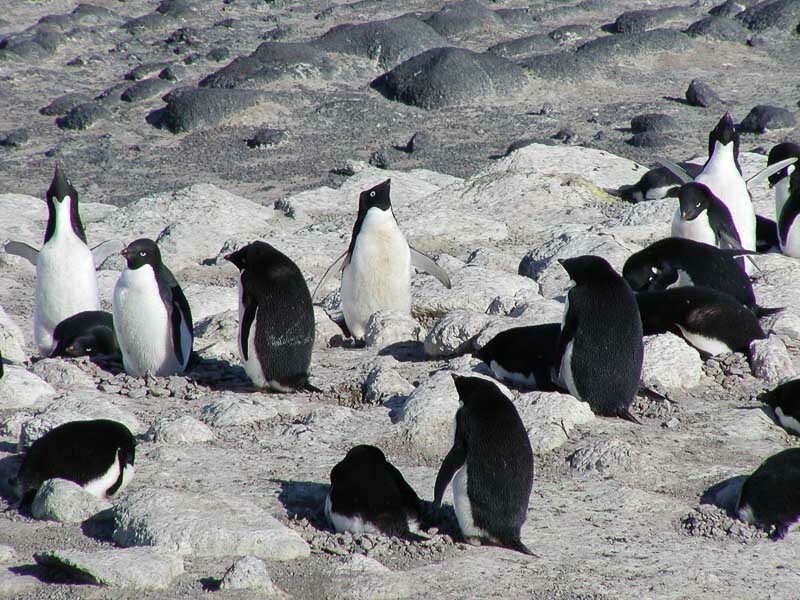 Stress, corticosterone, and heterophil to lymphocyte ratios in free-living Adelie penguins. The condor, 102(2), 392-400. Cockrem, J. F., Barrett, D. P., Candy, E. J., & Potter, M. A. (2009). Corticosterone responses in birds: individual variation and repeatability in Adelie penguins (Pygoscelis adeliae) and other species, and the use of power analysis to determine sample sizes. General and comparative endocrinology, 163(1-2), 158-168.